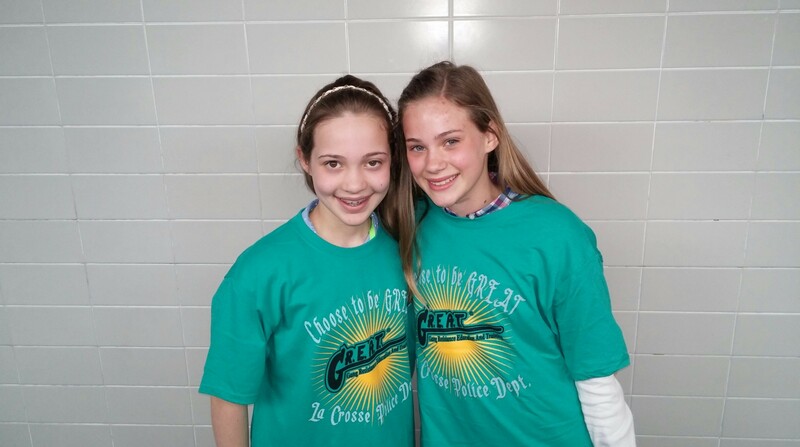 La Crosse Police Officer and “GREAT” (Gang Resistance Education and Training) Instructor Phil Martin reports Lincoln Middle School 6th grade students Katie Sauer and Tori Wichelt raised over $600 as part of their 6th grade, “GREAT” Project. The money was raised by Katie and Tori who held bake sales and garage sales where they sold Children’s Miracle Network Hospitals (CMNH) bracelets, homemade bracelets, hats and magnets. The also sold clothes to Once Upon a Child as well as accepted family donations. Both Katie and Tori plan on continuing the fundraising through the summer for CMNH. The money raised will be donated to CMNH at a ceremony today at Lincoln Middle School at 2:15pm. Congratulations and a “GREAT” accomplishment by Katie and Tori and their “GREAT” Instructor, Officer Phil Martin. ← Congrats Dr. Tom Thompson and TAMC Veterinary Staff!